Do you use Kotak Mahindra's Credit Card? How do you obtain the Kotak credit card statement? Do you wait for the report to get dispatched from the bank? The bank will provide the card statement at intervals as applicable. Do you want a more straightforward way? You can get Kotak Credit Card Statement online following simple steps. Step 1: Open your web browser and type 'Kotak Mahindra Credit Card Statement' in the search bar. Click on the first link from the search result list or directly visit the page https://www.kotak.com/ccstmt/nonlogincc/faces/jsp/nonLogin.jsp. Step 2: You will get directed to the official page of Kotak Mahindra Bank for Credit Card. 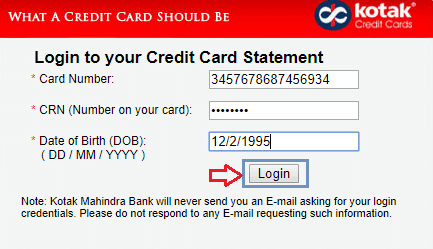 You need to enter the Card Number, CRN Number, and Date of Birth in the provided boxes. After entering the credentials without any errors, click on 'Login' button. Step 3: You will get directed to your credit card page where you can view different tabs, i.e., Current Statement, and Last Statement. Select the tab as required and get it printed clicking the 'Print' button. If you don't require printing the statement, you can view the report on the screen. If you are using Google Chrome browser, then you download the statement in PDF format. You can also choose the date range of your choice for the statement. It is quite simple to access the online account for Credit Card and get the statement online whenever you need. You can avail the facilities round the clock without any hassles. If above method is not working for you, then visit your branch where you issued the credit card and ask for the statement. Leave a comment if you have any queries regarding this article. Sir, First of all, I did not want the credit card but I was forced to apply for it. I have not requested for e-statement then why this charges of Rs. 234.82. I am paying regularly my maintenance charges. So please do not debit these charges otherwise please cancel my credit card. Sir, please change my email address for credit card statement. What are Details Required For What NEFT Transfer?